Vintage - Price-Kensington Cottage Ware Teapot with Lid, in the "Ye Olde Cottage" Pattern, Circa 1940-1950. Wonderful Price-Kensington Cottage Ware Teapot, Made in England, in the "Ye Olde Cottage" Pattern. Teapot is in the shape of a Thatched Roof English Cottage.. Spout and Handle are finished to look like Tree Branches and Bark. This is a lovely Teapot that holds about (6) Cups, and would make a statement on your Tea Table. Colors are bright, and does not show signs of wear. 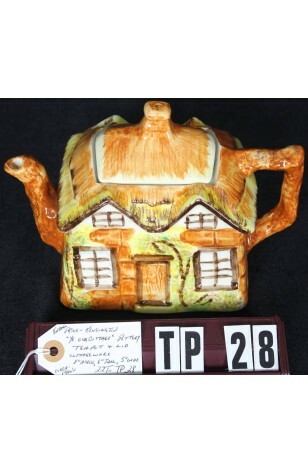 Wonderful Price-Kensington Cottage Ware Teapot, Made in England, in the "Ye Olde Cottage" Pattern. Teapot is in the shape of a Thatched Roof English Cottage.. Spout and Handle are finished to look like Tree Branches and Bark. This is a lovely Teapot that holds about (6) Cups, and would make a statement on your Tea Table. Colors are bright, and does not show signs of wear. Very Good Resale Condition with no known defects.